Krav Maga instructors Aaron Olson and Ben Turner demonstrate self-defense techniques for Greenville Library patrons. 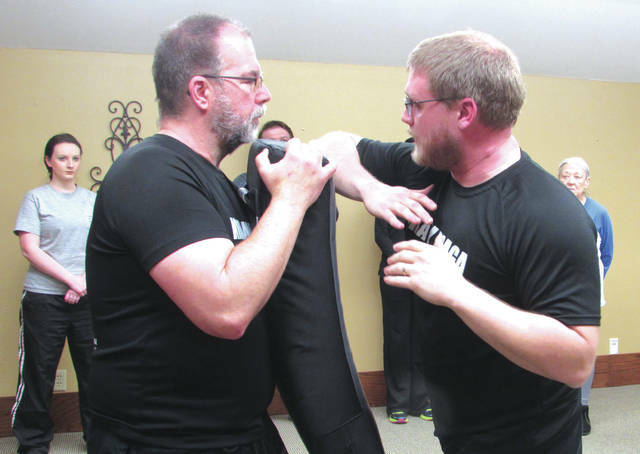 Krav Maga instructor Ben Turner trains with a Greenville Public Library patron. 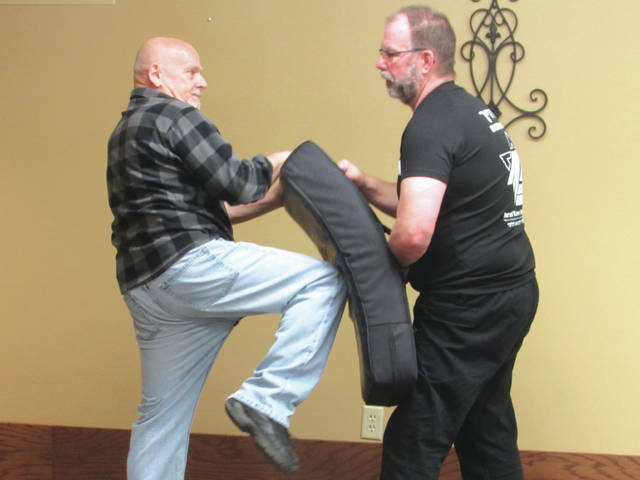 GREENVILLE – Patrons enjoyed a one-hour class by IKI Krav Maga instructor Aaron Olson at the Greenville Public Library Monday. In contrast, according to Olson, there’s very little element of sport to Krav Maga. Olson has been involved with IKI for just over a year, he said, in which time he’s put in approximately 500-700 hours of training. Olson is certified as a Level 1 instructor, meaning he can award students their first two belts, yellow and orange. The ranks progress through green, blue, brown and black. Olson plans on testing for his blue belt within the next month. In the meantime, Olson said that offering free monthly classes at the library will help fill a vital need in the community. IKI’s four main rules, according to Olson, are represented by the acronym AAPC. The A stands for avoidance, meaning that whenever possible, students should flee from a violent encounter rather than trying to engage physically. Next comes ability, which focuses on each individual student’s physical capabilities and level of proficiency. Then purpose: what are you trying to achieve? What is your assailant’s purpose? Finally, there’s circumstance. “Where are you?” Olson said. “In an alley? In Walmart? At the library? What’s going on around you?” All these factors, Olson said, will affect the course of action during a violent encounter. Olson’s main focus, he said, is to make his students feel safe. This entry was tagged Greenville, Greenville Public Library, IKI Krav Maga, Krav Maga, library. Bookmark the permalink.